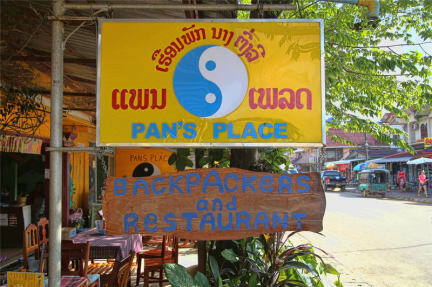 Pan's place, situated on the main street of Vang Vieng, offers a friendly home from home atmosphere for all our guests. We pride ourselves in offering very clean rooms at an affordable price as well as many other comforts and services. 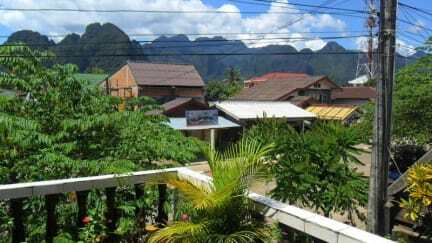 We invite you to be part of our extended family during your stay in Vang Vieng. Internet cafe, with discount rates for guests. Super friendly and helpful staff and a generally chilled vibe !! Friendly knowledgeable manager. In all important aspects very good. Decor tired, but would be happy to stay there again. All in all a good hostel for a good price. The rooms are simple and of the 2 rooms I stayed in one of the bathrooms needed some work. But the place has character! The blankets on the 2 personsbed are a bit small. Friendly staff, good terrace and great food (we had breakfast and lunch here quit often). Potentially has a pool in the near future! The shower never worked. Didn’t get hot water. The locks on the doors to the bathrooms didn’t work. The staff clean your room at 9am when check out is 11am and wake you up. But you can pay by card and the internet is semi alright. There’s no security for rooms and the safe box is downstairs. The staff are nice enough. The rooms were very basic/old. The fan worked, but was very noisy. There were holes in the screen and door that let mosquitos in. Changed 2 private rooms. Both had beg bugs. Know of 3 more rooms that had them. Lovely atmosphere and staff but our bite ridden bodies overshadow it.